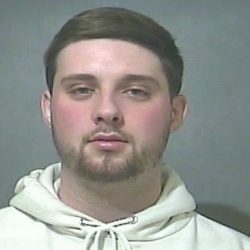 VIGO COUNTY, Ind – A Vigo County teen who has admitted to stealing an Indiana State Police issued handgun made his first court appearance Wednesday. 19 year old Logan Blubaugh of Rosedale is charged with theft, obstruction of justice, and unlawful entry of a motor vehicle. Police say Blubaugh was caught on security camera video walking around the state trooper’s vehicle. Authorities have yet to recover the .45 caliber handgun that they believe was thrown in a body of water.